The Original HP Maintenance Cartridge is designed to make your HP Designjet printer even easier to use by enhancing system reliability. You get trouble-free printing—every time—and fewer interruptions to help you get the job done right and on time. 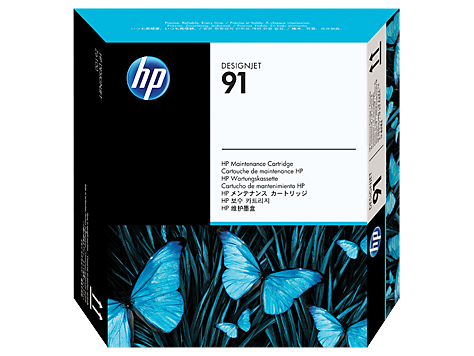 C9518A The Original HP Maintenance Cartridge is designed to make your HP Designjet printer even easier to use by enhancing system reliability. You get trouble-free printing—every time—and fewer interruptions to help you get the job done right and on time. The Original HP Maintenance Cartridge is designed together with the Designjet printer to provide consistent results and reliable performance. You get vivid color and smooth, neutral grays and you get clear, crisp lines and text, every time you print. With the reliable, trouble-free printing of Original HP supplies, avoid the trial and error that costs you time. The HP Maintenance Cartridge is designed with the printing system to enhance the reliability and ease-of-use of your printer over time. The Original HP Maintenance Cartridge is designed to make your printing system even easier to use. Get consistent, high-quality results every time. When you can count on trouble-free printing, with fewer interventions, your turnaround time is faster. To Recieve updates and possible rewards for Hewlett Packard (HP) HP 91 Maintenance Cartridge please sign in. To Recieve updates and possible rewards for Printer Cartridge, Ink & Toner please sign in.